I see, it's only bad coaching when Reeve loses. Never mind that she's dominated Agler when they've met in the playoffs. Never mind that Thibault got fired for losing that series to Indiana (that's how equal Sun management thought they were). Reeve said she didn't get the job done last season.Words out of the mouth of Reeve...then throw in the 2012 finals against Indiana...It wasn't just one time with Reeve...it's happened multiple times on the biggest stage. The Connecticut sun lost to a equally talented Indiana team in the playoffs.Thibualt wasn't outcoached,Indiana was just better. So was Indiana and Connecticut equal or was Indiana a better team? If they were equal, wouldn't that mean Thibault got outcoached? Good thing one of the coaches you have better than her hasn't lost multiple times on the biggest stage. Of course she said that. She's not going to throw her players under the bus. What about this latest series? The Sparks were the overwhelming favorite according to the Rebkell Series poll. The Sparks went from a 26 point lead in the first quarter of Game #1 to nearly choking that lead away, but they pulled out the one point win. That had to have taken the wind of the Lynx sails. They shouldn't have been able to recover. Then the Sparks proceed to gain a 2-1 advantage. How can Agler not finish the job at home? I would think some Sparks fans would call this a choke and aren't particularly happy about it. I do believe he went to the Finals once, but you're going to say he wasn't expected to win so he gets a pass. Not only does he get a pass, but he ranks #2 with you? Man, I can't figure out why. I disagree. Only outcoached in 2012. She didn't make the Finals in 2014, so which Finals that she won did she get outcoached? I'll give you a preemptive "give me a break" right now. If you win, you're not outcoached. picking up technical fouls during the playoffs. Well, if technical fouls score against you in being the best, I know you couldn't have voted Taurasi as the best ever. Aw, projections are so meaningful to you.... makes for easily twisted arguments. Somebody had to put the pieces together and keep it working even though they were the #1 target in the league. Whalen,Fowles,and Brunson all played in the finals prior to playing in Minnesota.....Parker,Ogwumike,Beard,Toliver,etc...never played in the finals before Agler became the sparks head coach. Now the Sparks are up to 2 and Toliver one. Woo hoo! The Sparks aren't stacked though, right? Not only are they stacked, they're younger than the Lynx, as people often point out. Assistant coach James Wade deserves a great amount of credit for the development of Fowles over the last year. I hear he's going to be working with Griner in Russia.This is why Griner will be my pick to win MVP next season. Seems like you're dissing Jim Peterson now. He couldn't have done the job? You called Fowles the #2 center coming in, but apparently there was room for improvement as there is for all players. Gotcha. I'm not sure I buy that Wade was solely responsible for improvement in Fowles. I actually give Maya more credit. But this goes to show it doesn't take much of a sample size of accomplishments for you to gush over a male coach. Bu,bu,but...Maya wins a championship every other year....so Reeve winning 4 out of 7 is a given....right? Okay, that was pretty clever, but I think there's room for both to be the best. Because she gave 1 away......Had Reeve not given the 2012 championship away, she'd be my undisputed #1 greatest coach of all-time. Definitely shows a high bar of expectations. I actually think Reeve and Agler are a lot alike. Both don't like to rely on rookies. Agler now is like Reeve a few years ago. He runs his starters into the ground because they can take it.... but maybe they ultimately couldn't take it in this last series. Reeve has learned the fine art of minute management through necessity. Can Agler learn the same? If he does, maybe then he'll be as good as Reeve. Of course Douglas barely played in the deciding game, getting hurt in the first quarter. Odd that you consider that absence an indelible black mark on Reeve but don't consider it at all for Thibault. 1.Minny nearly blew a big lead in game 2...and yes,the sparks did choke in game 4. 2.As I mentioned earlier in this thread,Reeve had a great 2017 wnba finals. 3.I don't remember Thibault having a WTF moment in the playoffs. 4.Fowles demanded a trade after chicago reached the wnba finals. 5.The dramatic improvement in Fowles' game coincides with the hiring of James Wade.Lets see if Griner makes the same leap next season.Reeve also deserves her share oF the credit. Can Agler learn the same? If he does, maybe then he'll be as good as Reeve. 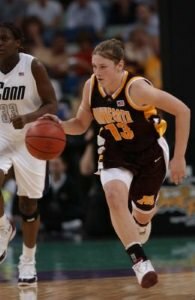 My biggest problem with Reeve going back to the 2012 finals is that she failed to make the adjustment on Larkins.....Larkins was killing McWilliams on the offensive glass.Reeve had two legit options.Go Small.Put Brunson on Larkins,and Moore on Catchings or,play Peters.But Reeve did absolutely nothing. I have no issue with people calling Reeve the greatest wnba coach of all-time.I just prefer Agler/Thibault over Reeve. You mean like T-Bone adjusted to stop Betty Lennox in 2004? Or maybe the way Agler made no adjustments at all in the finals just completed? What adjustment should Agler have made in the 2017 finals ? Look back upthread and you'll see several suggestions. Wiese finished the season shooting 6-22 (27%) from 3 pt range after starting 10-13.Wiese is also a bad defender. J.Jones is a undersized foul prone center.She's no match for Fowles. Gruda's very talented.But she commits to many unforced errors(Fouls,Turnovers,Poor shot selection).Gruda's an anomaly.She's tall,beautiful,and graceful.But her jump shot is cringeworthy.Gruda will make one good play,then two bad plays.It's frustrating to watch. When exactly should Agler have played these players ?.....when LA was up 1-0 ?..when the series was tied at 1-1 ?....when they were up 2-1 with a chance to close minny out ?......in the deciding game 5 ?....Sims,Gray,and Beard were balling for most of the series.I don't understand the obsession with playing S.Wiese.The wnba finals is no place to be experimenting with rotations....The sparks had minny right where they wanted them.Up 2-1 with a chance to close them out at home.LA blew their opportunity. Tbh i think Reeve and Agler are pretty similar. They love their vets a little too much sometimes but often put a good defensive and offensive team on the floor. If i needed to choose a coach for my franchise i would go with one of them. Gruda and Jackson-Jones aren't kids they were trying to develop. If they can't play a couple of minutes to keep the stars out of foul trouble, what's the point of having them on the roster? No match for Fowles? Five straight double-doubles and Finals MVP suggests that Ogwumike, Parker, and Lavender weren't much of a match for her either. Using the bench vets for a few minutes in the first half would keep you from having your second best player foul out early in the 4th quarter of the deciding game. That's bad coaching no matter how you slice it. So Agler did a bad coaching job this series ?.......The monday morning quarterbacking on rebkell...just wow....where were these complaints about Agler after gm 1....gm 2...gm 3....gm 4.........and most of the foul calls on Ogwumike and Parker were B.S. Nneka got Brunson on the elbow for the final foul. Shouldn’t be a complaint on that one. Brunson got away with the same contact all game long......Nneka got elbowed in the face 3 or 4 times in this series alone. The fact that you think the last foul on Nneka was a "phantom call" tells me you are not objective in this. She tapped a jump shooter on the elbow. That is 100% a non-controversial call. It gets called 100% of the time when it is seen since any contact to the elbow, no matter how light, can majorly impact a shooter. Any non-biased person, who is familiar with the sport of basketball, knows that is a foul. Even Nneka knew that was a foul which is why she didn't freak out. The 4th foul on Nneka and two of Parker's fouls were bad calls. They also got makeup calls on all three of those. But of course that becomes "most". I agrer that Agler did not do a bad job of coaching, but the idea that he or LA lost even in part because of the officiating is patently false. If you're not going to call the blatant fouls on Moore/Fowles,don't call the ticky tack fouls on Nneka/Parker.The last foul on Brunson was BS.....Be consistent. Give me the specific times please. I don't remember Brunson ever hitting a jump-shooter on the elbow. And if she did the refs surely didn't see it, because there is no "judgement" call involved in that. If they see it, they call it. And there was no way they could miss Nneka's foul based on where it happened. And lots more. Indeed, criticisms of Agler riding his starters too hard go all the way back to Columbus. I know Seattle fans who think he ended Lauren Jackson's career prematurely by trying to load too many minutes onto her fragile knees. If you're not going to call the blatant fouls on Moore/Fowles,don't call the ticky tack fouls on Nneka/Parker.The last foul on Brunson was BS. Hitting a jump shooter on the elbow is not "ticky-tack". That is a foul 100% of the time. And Moore was getting called left and right on her fouls. And are you forgetting the phantom contact that Brunson got called for on Paker right after Parker's phantom call on Fowles? Or the questionable call on Maya on Sim's 3pt shot? Confirmation bias is strong with this one. To be more specific,Brunson gets away with body contact all game long.But when Nneka does the same thing to Maya,she gets called for a cheap foul....Fowles and Briunson were literally jumping over the spark players backs to get offensive rebounds.Be consistent with the foul calls,that's all I'm saying. 2.Beard has been the inbounder in key late game situations all season long. However,Agler keeping Parker in the game with 3 fouls was stupid.